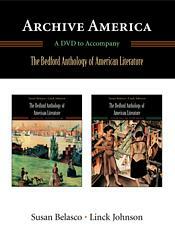 Archive America: A DVD to Accompany The Bedford Anthology of American Literature is designed for instructors to use in classroom presentations to help contextualize literary works in a manner that captures students attention. The focus is on major themes in American literary history that are brought to life through a rich collection of multimedia resources including fine art, contextual documents, maps, audio recordings, and video clips. The archive format allows for maximum use and flexibility. The DVD includes over 150 images, 25 textual documents, 20 audio recordings, and 9 video clips that cover a range of themes. Please explore the thematic DVD table of contents below, and click on the linked items to see samples of the rich materials this resource offers. Archive America is only available for instructors who adopt The Bedford Anthology of American Literature. For more information on the anthology, click here.